Join Spunkflakes for a night of Creep Suzzete down the Alleycat Bar in Denmark Street for a first outing of our new track Mess in a Dress, but don’t worry no blood so your party frock is safe! 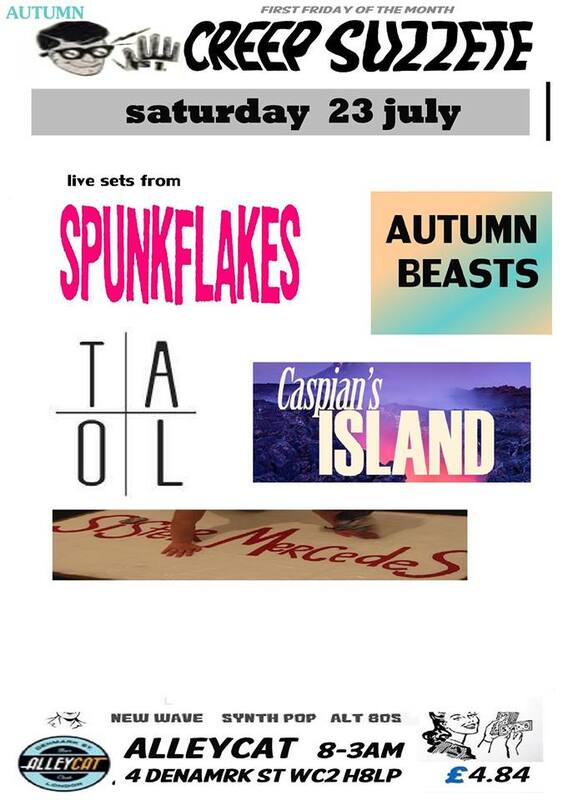 Spunkflakes will be performing all the tracks from our Tales from the Skip EP including 46 and No Bra, King Kink, Rent Boy Curry, Bieber Luv, Murder is Easy and our our rock-till-we-drop anthem Thundercrack plus our more recent offerings Death in Gay Sauna and Hot Bigot. 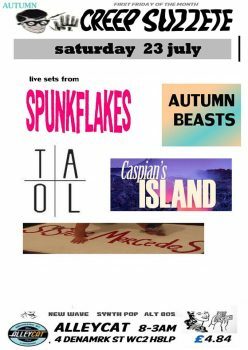 Creep Suzzete night presented by Max Mitchell with live sets from Spunkflakes plus Autumn Beasts • TAOL• Caspian’s Island • Sister Mercedes • Adventures of Light Speed • Entire Pop Urchin. Doors open from 8pm with live bands from 9pm. Spunkflakes on about about 10pm. Stumbling distance from everywhere in the West End and the booze keeps flowing with modern and new wave dance tunes until 3am.